Next Year Country: Does the Iron Lady's Legacy Reach as Far as Saskatchewan? This is what making Britain “great again” meant; for Thatcher the end justified the means. Believing that she was working in the best interest of “Britain” and its past commercial, imperial “greatness”, she didn’t need compassion for those who would be losers due to her uncompromising policies. And losers there were throughout Britain; her policies decimated many of the structures and support systems within civil society. Poverty-reduction, mental health, crime prevention and early childhood development were all hit hard. But people had always sacrificed for the empire; now they could sacrifice to build up the wealth of the corporate economy, which Thatcher believed would make Britain an international player again. In spite of the rhetoric that a free market would serve individuals, real individuals were subsumed under the ideology of unbridled economism which she espoused. While rekindling pride and patriotism for the long-gone empire, Thatcherism and her political look-alikes, especially U.S. President Regan, unleashed the dynamics of greed and ever-increasing inequality with which we live today. Two undertakings illustrate Thatcher’s means of restoring an imperial-like “greatness” to a Britain that once ruled the world’s largest empire, including Canada. One was her overseeing the short, definitive war over the far-away Falkland Islands; though never a fight among equals, this helped reestablish the perception of Britain’s military might. The second was her staunch opposition to the Commonwealth imposing economic sanctions against South Africa’s apartheid regime, and her stubbornly seeing Nelson Mandela as just another “terrorist”. These views are both reminiscent of the unflinching chauvinism that went hand in hand with the glory days of the British Empire. Improving the quality of life for the individual was never part of the end-game. Social and emotional supports are always required for a healthy individual to develop; it takes a village to raise a child. The libertarian ideology of competitive individualism that pits the one against the many with no positive role for government or the pursuit of the common good, is quite another thing. This leads to blaming and further victimization of those in need. And it was this, not the promotion of healthy individuals or families that Thatcher affirmed; her policies led to greater individual and social ill-health. The appeal to the self-reliance of a laissez-faire capitalism of bygone days was a populist ploy to get enough mainstream support for the restructuring of the economy in the interests of globalization; making Britain a bigger player in an expanding global market; keeping Britain from going too far into the EU; remaining flexible to form an Anglo-American military-industrial alliance, which we saw when the U.S. and the again Great Britain invaded Iraq. Thatcher simply didn’t care about justice, about who benefits and who suffers most of the burdens. Her most notorious comment was that “there was no such thing as society”. She stubbornly held to the view that “individualism” was the only significant reality. She didn’t enter the factual discussion about which social and economic strata and the individuals within them were hurt or making gains. Claiming no society, there was no need to assess societal impacts; there was no social responsibility! But she had no doubt about there being a “market” or about Britain trying once again to be an “empire”. She never questioned the reality of the party or the state that was being marshaled for her ideological ends. Thatcher may have even believed there was an “environment” for she expressed some concern about climate change. But this wasn’t why she shut down the coal mines; this was about ending public subsidies and weakening unions. But Thatcher couldn’t privatize the state nuclear corporation because no private corporations would take up the billions in public costs, including for nuclear waste storage. She nevertheless remained pro-nuclear to the end. Her political narrative excluded broad understanding. It’s difficult to imagine a level playing field where all individuals start life with equal amounts of deprivation or privilege and can equally pull themselves up by the bootstraps. Not even Adam Smith believed in such a simplistic model. But it didn’t matter, for Thatcherism was not about evidence-based policies. It wasn’t about compassionate government. What mattered was that her ideology helped the Conservatives and their financial and industrial backers to undertake what they wanted to do. There wasn’t any willingness to negotiate economic reforms, say along the lines that unions and businesses accomplished in Germany. Changes were forced through with the full force of the state by a P.M. who, as her ad man Lord Saatchi said, didn’t care whether people liked her or not. Of course she was finally dumped by the same party that first embraced her, when her highly divisive poll tax was undercutting the Conservative’s electoral power. We’re hearing nothing about this from those glorifying her in her death. The “anti-establishment” Thatcher would see the hypocrisy. 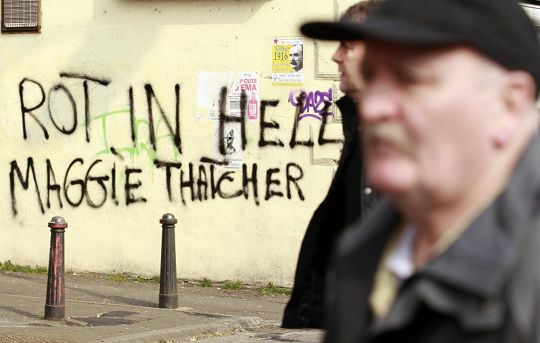 We can perhaps respect Thatcher’s fortitude but not her zero-sum end-game. Partly due to Thatcher making Britain “great again” Tony Blair joined forces with George Bush to breach the UN Charter and international law and invade Iraq. Britain is more polarized with inequality; days before Thatcher’s funeral there were celebrations that “the wicked witch is dead”. Thatcher’s legacy will remain that she was the first female British Prime Minister. But her harsh economic ideology ended up helping consolidate immense corporate power and wealth. One legacy from the greed that her policies unleashed was the 2008 financial crisis that brought the economy to its knees, and led to taxpayers everywhere having to bailout multi-millionaire CEO’s. It’s in the 32 trillion dollars locked away by the super-rich in off-shore tax havens, while governments everywhere enforce austerity onto those who have played by the rules. It’s in the Temporary Foreign Worker program and new EI practices in Canada designed to benefit the corporate bottom line. No wonder Harper sees himself as part of the Thatcher legacy; he is still trying to remake Canada along the lines of the iron lady. However on a global scale it’s more significant that in spite of Thatcher’s support for South Africa’s Apartheid regime, Nelson Mandela was ultimately freed and became the first black president of a post-racial democracy. When both Thatcher and Mandela are gone, these two global legacies will compete for awhile, after which the iron lady with her iron fist will be seen for what she was – a last stab at reclaiming the chauvinism, greed and military might that went hand-in-hand with monarchial colonial rule. And always at the expense of the citizenry! Two steps forward, one step back.